The World Cup, as the legend goes, has only been won single handedly twice: By Garrincha for Brazil in 1962 and by Diego Maradona in 1986 for Argentina. That humid summer in Mexico, the man who many consider to be one of the finest players ever, led Argentina to victory with five goals and out of this world performances which left opposition defenders trailing in his wake. Among his memorable feats, in what was arguably the last truly great World Cup, was that he scored a famous individual goal against England in the Quarterfinals, put away one nearly as good in the Semi Final against Belgium and despite heavy man marking by West Germany in the Final, he provided the assist for Jorge Burruchaga's tournament winning goal. He also found time to show his darker, or perhaps mischievous, side when he famously punched in the "Hand of God" goal against England. Sandwiched either side of that wonderful tournament for the Argentine icon, was the 1982 World Cup which was best remembered by a consistently fouled Maradona losing his temper and being sent off in disgrace against Brazil, and the 1990 World Cup in Italy where a half fit Maradona somehow helped a poor side to the final where they would narrowly lose to West Germany. The 1994 World Cup in the United States was seen as El Pibe de Oro's ("The Golden Boy") last chance to shine on the world stage. 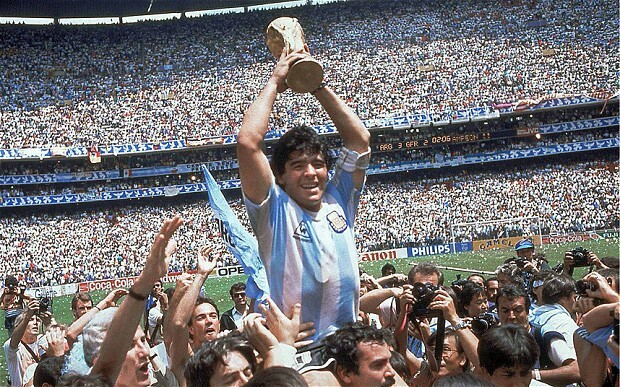 The years leading up to the finals in America had not been good one's for Maradona though. He had served a 15 month ban for being found with cocaine in his system, faced suspicion over his relationship with Naples' notorious mob the Camorra, fathered an illegitimate son, and had finally been transferred away from his beloved Napoli side. Struggling with his weight in the months leading up to the World Cup, Maradona appeared to have gone on a strict diet and exercise regime to regain his fitness and he looked to be somewhere near his best when he helped Argentina rip apart Greece 4-0 in their first match of the tournament. 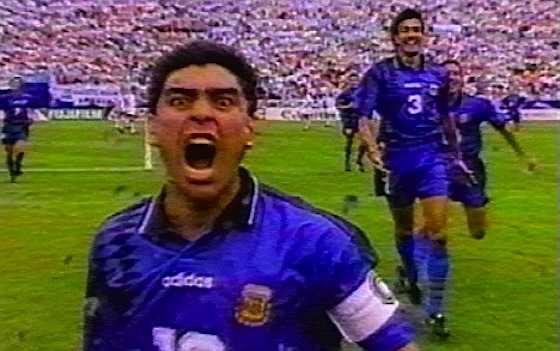 Maradona's contorted face, screaming into the camera after scoring the final goal in that win was an image that would be replayed over and over in the coming months but not for the reasons he would have liked. Following a 2-1 win over Nigeria in their second match, Maradona was reported to have failed a drug test. The Argentine captain was found to have the banned drug ephedrine, primarily used for weight loss, in his system. 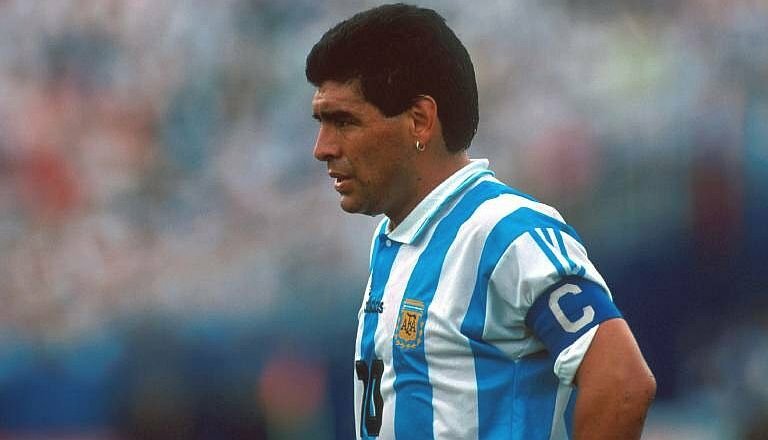 Maradona claimed that his trainer had given him the energy drink Rip Fuel, and that they were unaware of the fact that it contained ephedrine. FIFA brushed aside his claims of innocence and one of the finest players ever had played his last minute at the greatest football show on Earth.